Heaven is not empty: it is already inhabited by a multitude of spirits of the righteous, whence they so often appear to those living on earth. It is characteristic of man to begin a given deed, labor, or ascetic struggle with enthusiasm and zeal, but later to weaken, forget, and quit what has been begun. This happens constantly with the ascetic struggle of the fast. Man, for a short time, is contrite, judges his former actions, and sets out on the path of life indicated by his conscience and the Gospel of Christ; he becomes more attentive to every admonition of his conscience and at first relatively easily casts aside his former temptations. However, this generally does not last for long. 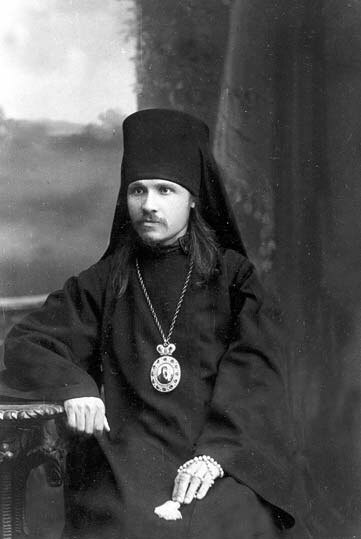 First his previous attentiveness weakens, and man already does not hear many promptings of his conscience; later, when his attention has weakened, he gradually loses his reserve of spiritual strength that he had gained through spiritual exercises in the ascetic struggle of the fast, and man altogether weakens spiritually and is no longer able to raise himself and follow the path he has begun. 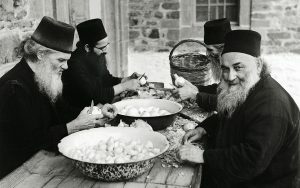 Knowing this, the Holy Church, as though deliberately, following the first week of Great Lent, when it has introduced its children into the specially intensified ascetic labor of the fast, reminds us today of how easily our attention may weaken, after which our entire soul undergoes paralysis. She reminds us in the words of today’s Epistle reading: We ought to give the more earnest heed to the things which we have heard, lest at any time we should let them slip (Hebrews 2:1), and in the Gospel reading, by reminding us of the paralytic, the Holy Church warns us against spiritual paralysis. She reminds us of the Christians from among the Jews who had already undergone the great ascetic struggle of suffering for Christ but who had, however, already ceased to be attentive to the word of preaching and had grown paralyzed from temporal temptations, by giving us the example of the paralytic, which is how such inattentiveness ends, which begins by relaxation: complete spiritual paralysis, during which one does not have the strength even to raise oneself up and perform a single good deed; and even one’s faith so weakens that only the intercession of those with stronger faith, the saints (as the paralytic was healed by the faith of those who brought him), can return one to the path of salvation. Even when Christ comes, such a one is not spiritually strong enough to raise himself and endeavor to meet Him, and to enter the open doors of His heavenly chambers. But Christ is not as visibly close to us, as He once was to the paralytic: He will come again to earth only at the end of the ages, and He will be met only by vigilant people, such as the wise virgins, who have oil in their vessels for their lamps. Now Christ is in heaven, and how difficult it is to ascend to heaven for one living on earth – and is it even possible for a paralytic? After all, our fatherland is in the heavens, and our ascent thereto is more difficult than if one were to begin to ascend a latter reaching up to the very sky; and it is that much harder with self-urging to ascend to a good that is much more significant than climbing an ordinary mountain. Is it possible for one living on earth to ascend to heaven? Is this not an empty dream, about which people of this world and the wise of this age laugh? Indeed, the ascent to heaven might seem like a strange, unrealizable dream, if Christ had not already ascended thereto and opened up the path to all His saints. The Old Testament Psalmist once cried out: The heavens declare the glory of God, and the firmament proclaimeth the work of His hands… Their sound hath gone forth into all the earth, and their words unto the ends of the world. In the sun hath He set His tabernacle; and He, like a bridegroom coming forth from his chamber, will rejoice like a giant to run his course (Psalm 18: 1, 4-5). Was not the Psalmist speaking more of other heavens: of the Holy Apostles, who spread the Good News of Christ to the ends of the earth, as rays of the Sun of righteousness, bringing His light to the ends of the world? And was it not they who were revealed to John the seer-of-mysteries, who saw this sign: a woman clothed with the sun (Revelation 12) – that is, the Church of Christ – having put on Christ from the day of the Baptism of her children, and on her head a crown of twelve stars, that is, the twelve Apostles of Christ? And if in the same vision, the dragon-devil lured from heaven a third of the stars – that is, a multitude of fallen angels – do there not shine in their place a multitude of new stars in the spiritual heavens: the saints of God, with whom Christ the Redeemer filled up the ranks of fallen angels? Thus, heaven is not empty: it is already inhabited by a multitude of spirits of the righteous, whence they so often appear to those living on earth. If this is so, then spiritual ascent is possible. If it seems impossible to us, that is because we ceaselessly burden ourselves with the passions of life, by which our very heart – the source of our life – becomes chained to the earth, making ascent to heaven impossible. Is the thought of the ordinary person capable of flying around heaven? After all, if all our thoughts constantly flew to heaven; if our hearts raced there on the wings of ardent love for the “desired” Christ, Whom man with thirsting love “received,” like the Hieromartyr Ignatius, then who could prevent man’s ascent “to the mountain of the Lord,” to the very heavens? No matter how high heaven is, no matter how high the Lord’s mount may be and the spiritual path to its ascent, man can perform this ascent, if only he throws off from himself, especially from his very heart, the burden of the heavy chains of sinful passions and habits. 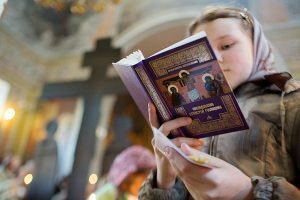 How much more easily did the saints ascend to heaven, who so strove to alleviate their souls from the weight of the passions of life by fasting and prayer. Even in the Old Testament, was not Enoch – by fasting from every evil and walking only before God – taken living and in the body to heaven? So did the saints ascend to heaven. And we, who have barely ascended the first step of Great Lent, have already ceased to watch carefully where the Lord’s path is leading us; we who have just remembered (in the Canon of St. Andrew of Crete) so many saints of the Old and New Testaments, who followed this path, in order to strengthen ourselves, have already fallen onto the bed of spiritual illness and paralysis; it was only just with sorrow, it would seem, that we cried out, each for himself: “Now I wear a heavy yoke,” and now already we have diligently started up again, multiplying this burden from hour to hour, with which we can not only not ascend to heaven, but we cannot move even one member of our soul in order to do something pleasing to the Lord. What can prevent the soul from flying there? The body? But let it lie in the grave until the end of the ages – but will the spirit really be confined to dust, hidden in the bowels of the earth, if while living on earth, man was not attached to anything earthly? For the spirit, which has amassed in itself such a multitude of holy thoughts, feelings, and desires, could the weight of the body be an obstacle, like an enormous balloon filled with light gasses easily ascends to heaven? Moreover, if the heart has loved the Lord as fully and strongly as death, then it has already ascended to the Lord – already during the earthly life of man heaven and paradise open themselves in his very heart; and man, living on earth, moves to heaven, to paradise, and does not notice anything earthly, but passes by them, not being bound by anything, like someone overcome by the bliss of earthly love does not notice anything, neither hardship nor suffering. How we need to ascend more often to heaven, even if in thought, although in the ardent desire of our hearts, in our longing for heaven, from which man fell, crying for the lost paradise! One holy thought leads to another and, having accumulated a multitude of them, the soul filled with them will easily and irresistibly strive for the heavenly heights. It is difficult to climb a mountain reaching the heavens, but step by step, gradually and imperceptibly, one can climb easily, without any special labor, especially because the Lord Himself gives unceasing aid and delight to the heart to those climbing towards him, showing them what Eye hath not seen, nor ear heard, neither have entered into the heart of man, the things which God has prepared for them that love Him (1 Corinthians 2:9). May the words be fulfilled in you that were spoken about Israel, by Hosea the Prophet, which I have often recalled here: I will heal their backsliding, I will love them freely… I will be as the dew unto Israel: he shall grow as the lily, and cast forth his roots as Lebanon. His branches shall spread, and his beauty shall be as the olive tree, and his smell as Lebanon. They that dwell under his shadow shall return; they shall revive as the corn, and grow as the vine: the scent thereof shall be as the wine of Lebanon. Ephraim shall say, What have I to do any more with idols? I have heard him, and observed him: I am like a green fir tree. From me is thy fruit found. Who is wise, and he shall understand these things? prudent, and he shall know them? (Hosea 14:4-9). Amen.